Mary has been the Managing Director of HealthHarmonie since 2007 and has now taken on the role as Chariman of HealthHarmonie. In this time Mary has led HealthHarmonie from being a private patient menopause and gynaecology clinic to a patient focused large provider of community services for the CCGs. In 2008 she secured HealthHarmonies’s first NHS contract and the company has seen significant year on year growth since then. The business is now a close knit team of almost 300 medical professionals, managerial and support staff, and has invested heavily in IT and support systems. In 2016, Mary completed the Goldman Sachs 10,000 Small Businesses programme to support HealthHarmonie’s growth and development and has established a number of key relationships for the business. Andrew has been with HealthHarmonie for four years, initially joining as Head of Business Development before moving to his current position of Managing Director. He works closely across all teams to ensure the smooth day-to-day running of the business and takes a lead role in developing IT provision and policy. Andrew has over 10 years’ experience in healthcare management, having worked in a number of different areas; including GP Practice Management, Dentistry, Secure and Police Healthcare, End of Life Service and other community healthcare environments. He also spent several years teaching English in Japan before settling in the UK. Nicole is our Operations and Commercial Director, and has overall responsibility for the smooth running of services, our Governance and Audit teams as well as Business Development. Nicole has an advanced skill in understanding customer needs, effective communication, motivation of teams, tracking and measuring team performance, creating positive learning environments, enforcing standards and alignment to company values. Nicole has over 10 years’ experience within healthcare and healthcare management working within Primary, Secondary & Community settings. Dr Paul Crowe chairs the Medical Advisory Committee. He is a Consultant Interventional Radiologist at Birmingham Heartlands Hospital, a fellow of the Royal College of Radiologists (FRCR) and of the Faculty of Radiologists of the Royal College of Surgeons in Ireland (FFRRCSI). He is a member of the British Society of Interventional Radiology (BSIR), the Cardiovascular and Interventional Radiology Society of Europe (CIRSE) and The Society of Interventional Radiology (SIR, USA). He has special interests in vascular and urological radiology, uterine artery embolisation for fibroids as well as a wide range of minimally invasive interventional radiology procedures for both NHS and private patients. 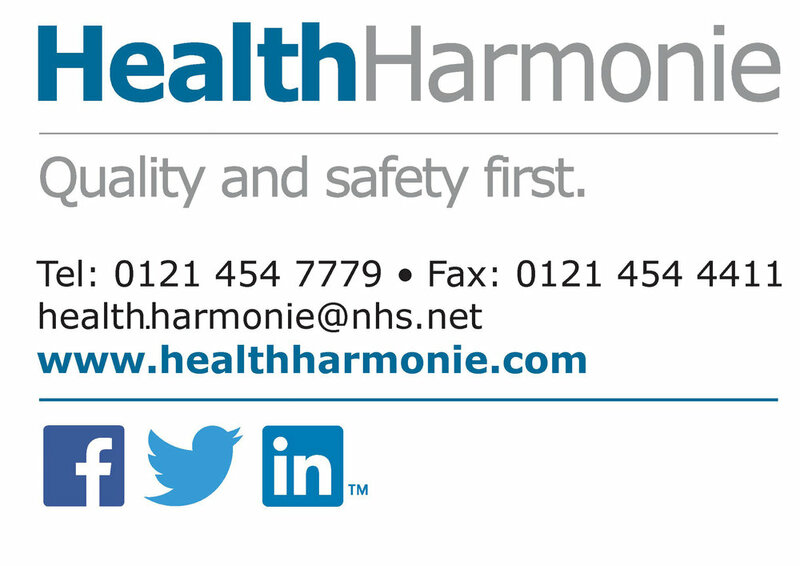 Mr Joe Jordan is HealthHarmonie's Governance Director and was a founding member of HealthHarmonie. Mr Jordan is also a fellow of the Royal College of Obstetricians and Gynaecologists. Andy is a chartered accountant and experienced business adviser. He has worked with Mary since 2007 to bring stability and growth to the organisation. Previous to joining HealthHarmonie, Andy worked as a senior partner with KPMG’s Transaction Services section building a team of over 40 senior professionals. In addition to Andy’s work with HealthHarmonie he works as a non-executive director for a number of growing companies. Dr Al Abadie has been a Consultant Dermatologist at the Royal Wolverhampton NHS Trust since 1997. In addition to his extensive hospital work he is a Senior Academy Tutor and Senior Lecturer at the Medical School, Birmingham University. He is also an external examiner for the Medical Doctorate MD degree. Furthermore, he is a national and international speaker with numerous publications in Peer Review, Medical Journals, including the Rook Textbook of Dermatology. He is a lead clinician in Community Dermatology and a keen educator to GPs, organising the annual Wolverhampton and Black Country Dermatology meeting, this year being the 11th meeting. Dr Al Abadie is a Fellow of the Royal College of Physicians (FRCP), Glasgow, holds a Doctorate in Dermatology (PhD), Sheffield, and is also a Fellow of the American Academy of Dermatology and European Academy of Dermatology. Professor Stephen Vernon has been a Consultant Ophthalmologist in Nottingham since 1986 with a wide experience within the subject having run specialist clinics in glaucoma, diabetic retinopathy and neuro-ophthalmology. His research interests includes ophthalmic epidemiology and glaucoma detection and management. He has published over 170 academic papers and a number of textbooks and chapters in textbooks as well as educational articles for ophthalmologists and optometrists. He has organised and chaired many scientific symposia, is a regular speaker at international meetings and was an early pioneer of shared care in glaucoma. In 2008 the University of Nottingham bestowed upon him the title of Honorary Professor and in 2009 the College of Optometrists awarded him an honorary fellowship in recognition for his research into glaucoma and for his work for the College. In May 2016 he was appointed as Vice President of The Royal College of Ophthalmologists. Dr Gabriel is a highly experienced clinician of nearly 30 years’ experience, Dr Gabriel is a GPwSI in minor surgery (excision biopsy of skin moles, sebaceous cysts, lipomas etc) and musculoskeletal conditions. He is also a practice lead in various areas of medicine and has been a GP trainer since 2009. Dr Gabriel provides clinical oversight and guidance for minor surgery. He is actively involved in the development of services and conducts monthly audits of clinicians work. Dr Grainne Murphy, MB BCh BAO BMedSc, is a Consultant Radiologist who conducts our clinical audits as well as providing support and guidance to our team of sonographers. Grainne is a highly experienced Consultant Radiologist, who has gained experience in Ireland, Canada and the UK. Grainne has been published a number of times and has presented at many conferences around the world.